The Commonwealth of Virginia and Transurban agreed Tuesday to $1 billion of four road projects in Northern Virginia which are expected to ease congestion in the region. WASHINGTON — The Commonwealth of Virginia and Transurban agreed Tuesday to four road projects in Northern Virginia which are expected to ease congestion in the region. A 2.5-mile extension of the 495 Express Lanes north to the American Legion Bridge. Two new Express Lanes will run in each direction of the Beltway (I-495) from the Dulles Access Road to the American Legion Bridge at the Maryland border. The governor’s office said the move would relieve “one of the worst bottlenecks in the region” and reduce neighborhood traffic in McLean from drivers cutting through. In Maryland, officials are separately considering a plan to add capacity on their side of the Beltway, including the Legion Bridge. The addition of a reversible ramp connecting the existing 95 Express Lanes at Opitz Boulevard, which will allow Express Lane drivers to exit onto Opitz Boulevard. A southbound Occoquan auxiliary lane in Interstate 95 in Woodbridge that will connect the southbound Route 123 ramp to I-95 with the offramp at westbound Prince William Parkway. Construction on those projects could begin next year. 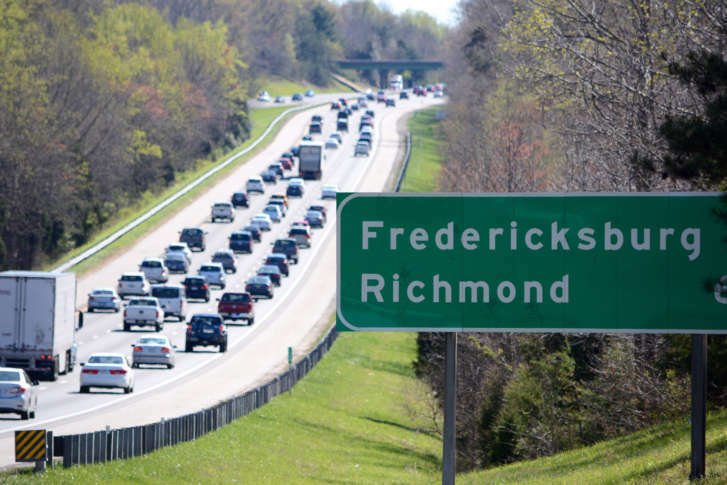 The commonwealth and the company also finalized a proposal for a 10-mile extension of the I-95 Express Lanes to Fredericksburg. Construction will begin later this year, with the opening set for the fall of 2022. Northam’s office said in the statement that Transurban has committed more than $1 billion to the projects. Monica Backmon, executive director of the Northern Virginia Transportation Authority, said in a statement, “While all of the projects will reduce congestion, the 2.5-mile extension of the 495 Express Lanes north to the American Legion Bridge and the construction of a new southbound Occoquan auxiliary lane on I-95 in Woodbridge, will directly impact two of the worst bottlenecks in the Commonwealth. WTOP’s Neal Augenstein and The Associated Press contributed to this report.